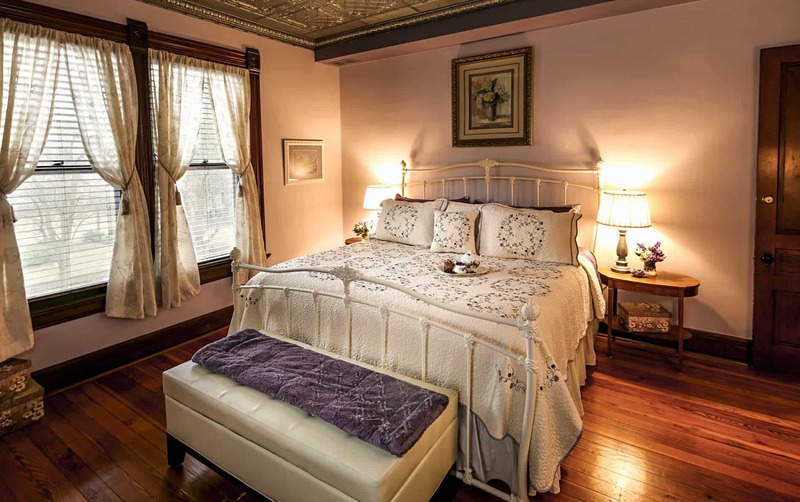 The Church Steeple Suite, named for the beautiful church spire outside the window, provides a warm and inviting Cincinnati getaway, reminiscent of a country setting. The spacious two-room, second floor suite is comforting in shades of lavender, plum, and white, featuring cottage-style furniture. Exposed original hardwood floors, original doors and millwork, and decorative ceiling tiles complete the historic feel of this suite. A soak in the double Jacuzzi tub next to the fireplace will ready you for a restful night’s sleep in the king-size iron bed, complete with pillow-top mattress. The cozy daybed with trundle can sleep two additional guests. The sounds and smells of breakfast being prepared will tempt your senses in the morning. You can even get your breakfast delivered right to the room’s private dining table. All rates subject to 12.34% sales tax. Base rate subject to change at any time.